Birds have behaviors just as we do, but if you’ve ever observed them “behaving” you know that some of their actions are just baffling! Have you ever witnessed a bird “bathing” in dust? Believe it or not, birds will often do this to either reduce moisture, align feather barbs (a series of branches that connect to each other), or to remove external parasites. Researchers have identified over 200 species of birds that have been spotted putting ants in their feathers. This is called anting and is done as a way to rid or reduce external parasites – it can also soothe a birds skin irritations. Two species of birds in particular, Chickadees and Red-breasted Nuthatches, weigh their seed before deciding whether or not to eat it. According to the Department of Biology at University of Vermont these two types of birds will choose oil sunflower seeds that have considerable heft to them over ones that are lighter because they use a lot of energy finding the feeder they want to get the most out of their effort. Our feathered friends have a variety of mating behaviors including nest building, singing, dancing, and eating. Spring time is the ideal season to observe these behaviors conveniently in your backyard. Woodpeckers court by the familiar sound of pecking a tree or other hard surfaces – the louder the better, according to females! This same pattern is carried out by other birds who sing instead of peck. Male birds who can belt out more tunes are considered more attractive. Seabirds and water fowl bob their heads, bow and flap their wings. Cranes dance, as do Mourning Doves and Mockingbirds. Jay birds and Cardinals will offer their seed to share, while House Wrens will construct an entire nest! Now here is something you’ll find interesting… most birds only mate for one season, while others will mate for life – some even multiple times during a single season. The faithful species only have one mate until death – these include Geese, Swans, and Eagles. House Wrens and hummingbirds are the “run-arounds.” This behavior is only apparent among 2% of bird species however, this behavior makes it difficult for males to take care of all their broods, leaving the mother as the sole care taker. Birds need new threads too – feathered threads. 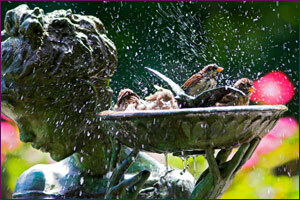 Birds will “shed” most of their feathers or only specific areas because just like humans they wear out and fade. This behavior is known as molting. Some species have quite a dramatic change like that of the American Goldfinch which changes just about all its feathers twice a year! The molting cycle will normally run several weeks or months depending on the species. This entry was posted on Saturday, March 10th, 2012 at 5:19 pm	and is filed under Bird. You can follow any responses to this entry through the RSS 2.0 feed. Both comments and pings are currently closed.